I've seen American oystercatchers (Haematopus palliatus) at Marine Park in Brooklyn, Jamaica Bay Wildlife Refuge and Breezy Point in Queens, and Wolfe’s Pond and Mt. Loretto Unique Area on Staten Island. I’ve also seen them at Nickerson Beach on Long Island. They are delightful birds that chatter and fly around, showing off those long orange beaks and those red and yellow eyes. They nest at Breezy Point and at Nickerson, and I imagine other places around New York City as well. Can You Spot the Ringer? 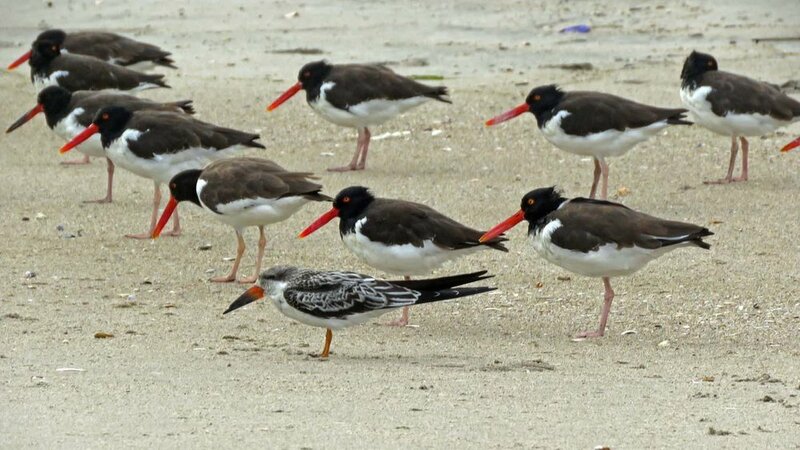 On October 2, 2018, a young black skimmer was seen hanging out with American oystercatchers on the beach at Breezy Point, Queens. The little bird seemed to be just trying to fit in. The video and photos show the oystercatchers on October 2 and 9. I've seen American oystercatchers (Haematopus palliatus) at Marine Park (May 30, 2017) and Jamaica Bay Wildlife Refuge (June 1, 2017). I was able to take a few photos and add a Filming the Feathers video. I didn't get to see them cracking open oyster shells, but I hope to soon!